Thank you for viewing our "personalised wine label service home page". We can supply red wine, white wine, champagne, sparkling wine, whisky, port or cognac with a personalised label. You need only order one bottle. Delivery information at bottom of page. People love receiving a bottle of delicious wine with their name on the label. A Designer Wine is the ideal gift or present for the wine lover to commemorate that special occasion or just for fun - from only £17.95 for wine £29.95 for champagne delivered! 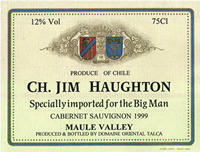 KENSINGTON WINE WAREHOUSE, Unlike others who may offer this service we are established Wine Merchants in our own right. holding stock of over 400 different wines, Champagnes, liqueurs, cognacs and vintage Ports . Our selection offers wines that will not only delight the recipient with the personalised -Message but also surprise them with the fine flavour and body! If you require a particular wine or spirit not listed here- please ask - we should be able to come up with it . The colourful Designer wine labels are specially selected by us for their quality of design and attractive colours. They are printed and designed in France and normally are only used on the most expensive wines. * There is an excess delivery charge for Northern Ireland & Northern Scotland please ask.